There�s so much discussion right now about women in the workforce. Are we leaning in or opting out? Can we have it all or are we asking too much? But the headlines and the statistics don�t tell the whole story. The truth is, many women today are breadwinners and they are caught in a perfect storm of male-dominated culture at work, traditional social norms at home, and outdated schedules in the schools. 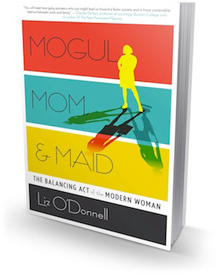 Join Liz O�Donnell, author of Mogul, Mom & Maid: The Balancing Act of the Modern Woman for an honest discussion about how women are balancing home life and career. We�ll look at the choices women are making, the options they have, and the impact these decisions have on themselves, their families, and the businesses that employ them. Liz is a communications pro, author and blogger. She has spent most of her career helping companies create and execute communications and marketing programs that track to business objectives and drive measurable results and impact. Liz has worked with start-ups as well as Fortune 50 companies. Her clients have ranged from enterprise and consumer technology companies to large commercial banks to sustainable building materials and mainstream consumer products. As the author of Mogul, Mom & Maid: The Balancing Act of the Modern Woman (publish date Nov. 2013), and the founder of Hello Ladies, one of the top 100 websites for women according to Forbes and a Stevie Award finalist for Best Blog, Liz is particularly tuned in to the growing demographic of working mothers and the unique challenges and opportunities they face. She is passionate about helping women thrive and helping companies reach and mobilize this powerful resource. Her opinions on the topic have been sought by Marie Claire, The Levo League, The Intuit Small Business Blog and GoBankingRates.com. Liz is a regular contributor to The Huffington Post, MomsRising and Manilla.com. Her writing has appeared in The Boston Sunday Globe Magazine, The Glass Hammer, BlogHer, PTO Today, The Atlanta Journal Constitution and Gatehouse Media. As fluent in social media as she is in traditional media, Liz is a �Voice of the Year� and a �must read� political blog according to BlogHer, and a sought-after beta tester for new social platforms and apps. Limited on-site registration is available on a first-come, first-served basis. For information regarding on-site registration, please contact Jennifer Beckey (Tel: 858-518-0859) ([email protected]).